Have you seen Your Year on Twitter yet? If not, I highly recommend that you do! Twitter has partnered with Vizify to bring its users a recap of their tweets and trending topics from 2012. The page calls out your Golden Tweet – the one that got the maximum responses/ retweets and your Golden Follower – the one that you interact with most. 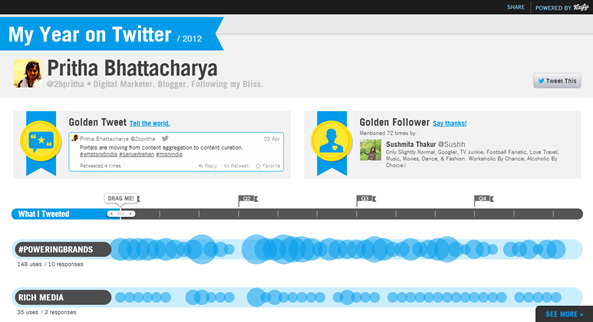 It also provides a timeline of top trending topics from your tweets. Very very cool and reminiscent of Intel’s Museum of Me visual social archive, Facebook app last year. In addition to this interesting personalised app, there are other sections that call out Golden Tweets – with the maximum re-tweets last year, topped by of course @barackobama’s ‘Four more Years’; Pulse of the Planet recapping the biggest conversations of the Year led by the Summer Olympics; Top Trending topics and Top New Tweeps worldwide. Twitter has become a social media vehicle to reckon with, spawning a new language (who would have known hashtag and tweeple would qualify as real words!) and sometimes giving a voice to people who have something to say to the world at large.